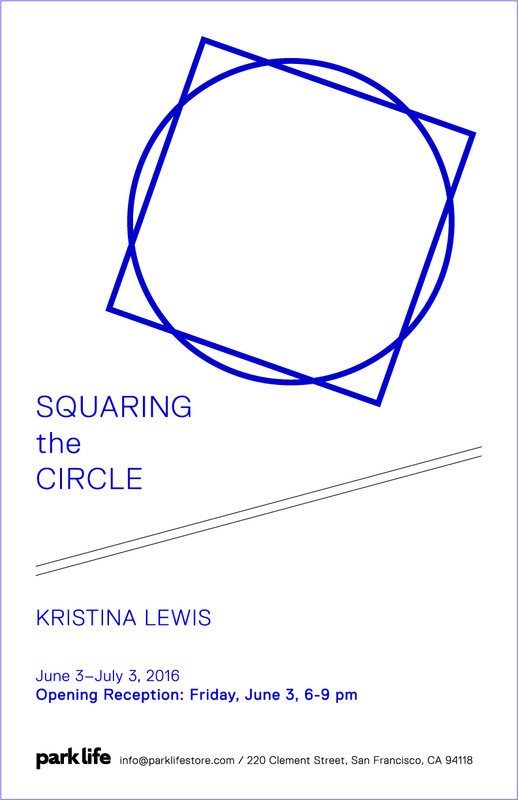 We are happy to announce that Kristina Lewis’ show SQUARING THE CIRCLE opens Friday June 3, 2016 at Park Life Gallery. Firmly planted here on Earth and totally at the mercy of nature’s chaos, people of past eras used materials at hand to try to bridge the gap between the palpable and the impalpable—using objects as intermediaries to reach beyond the limitations of their bodies. Totems, masks, amulets, shields, statues and vessels were infused with holiness in their maker’s imaginations, and charged with the task of connecting mortals to unknown deities. Imagining that their meek constructions would be read, understood and perhaps satisfy these invisible beings, people used them in ceremonies, rituals and burial to relay all their hopes, and mitigate their fears. Today, though still limited by the earthly sphere, our territory is man-made and high tech. The “incomprehensible” we strive to understand may or may not be divine. Out of a heavily mediated and consumerist landscape, in Squaring the Circle, I experiment with constructing “sacred” devices (future relics) out of the stuff around us—lines, angles and arcs of plastic, nylon, wood and metal. Still grappling with the unknown, whether in the scientific or spiritual realm—I imagine that we will continue our attempts to grasp the infinite with finite things.